When I was invited to test products from the OZ Naturals range, I researched the brand and the products before accepting, as I normally do. Having just turned 61, I may be an ideal test subject for anti-ageing preparations, but since my skin is more fragile and sensitive than ever, I have to be very careful about what I put on it. 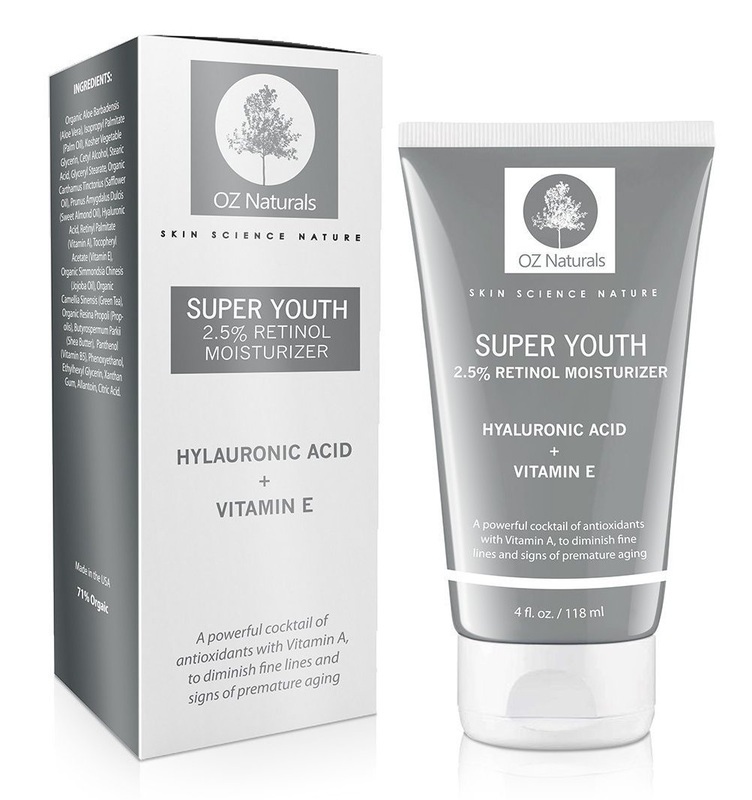 Now about the serum: in the past I have used products containing hyaluronic acid, but apart from how much active ingredient is actually in the bottle, it seems that the synergy with other components is crucial. According to the label, this serum also contains Vitamins C and E and Green Tea, all powerful skin regenerating ingredients. As usual, when testing skin care, I discontinued my previous serum and eye cream and started using the OZ Naturals products instead. This serum is packaged in a glass bottle with a dropper to facilitate precise application. The contents are 1 fluid ounce or 30 ml, which is pretty standard, but you need very little to cover your whole face and neck, making this product really good value for money. It looks like it can easily last a couple of months. With gentle massage, the almost clear gel sinks in easily and dries quickly. You then apply your favourite cream or oil on top, which now has a much better chance to penetrate and actually do some of the wonderful things promised on the box. A serum is a carrier, so it is very important to choose an effective moisturiser or nourishing cream to apply afterwards. 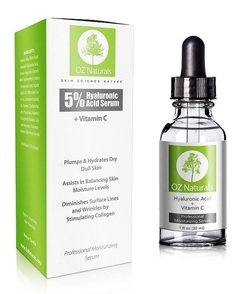 Reading the FAQ on the OZ Naturals website, it says you can actually layer this serum with their other one, but even using them one at a time, after three weeks, I have already started to see some very encouraging results. My skin seems plumper and a lot firmer, especially over my cheeks and jawline and the deep lines around eyes and mouth are less noticeable. The formulation is very gentle on my skin, no redness or break-outs, in fact it has a cooling effect when I apply it after derma-rolling. I would normally use an anti-ageing product for a month or two before commenting, but these serums are very fast-acting and I feel comfortable reporting this early improvement. Compared to other serums I've used (Estee Lauder and other well-publicised brands which did nothing for me), this is one that I will keep using when my trial bottle is finished. I have not found anything else yet that works this well and this quickly. Well, I am really impressed! My experience with face masks is of the thick clay variety; effective but often requiring mixing, messy application, careful timing and laborious removal. This hydrating mask is completely different. It is a creamy, off-white gel, conveniently packaged in a large tube and ready to apply. It spreads easily, just like a cream, clings to my skin effortlessly, is very easy to apply exactly where I want it and dries to a clear, shiny finish. The directions say to leave it on for 15-30 minutes. I did that the first time. But then, in the spirit of extreme testing, the second time I left it on for an hour and the third time much longer, as I did not set a timer. In each case, after removal, my face looked fresh and rosy and, at my age, that takes some doing! Unlike other masks, it does not set in a stiff, unwieldy way followed by crazy-cracking. In fact, it doesn't crack at all, it remains somewhat elastic and I forget it's there. My face is not frozen in place, there is no pulling effect and I don't scare any unsuspecting passers-by. It washes off easily in warm water and leaves no awkward residue along the hairline. For this reason, it is ideal as preparation for a night out or social occasion. My skin emerges tightened but with a soft, smooth feel, lines less evident, pores well closed, ready for moisturizer and make-up. I can see why they say it's suitable for daily use! Something else which is unique in my mask experience: I can put it all over my face, including the eye contour. Today my husband had been telling me that I looked tired but, after the mask, he thought I had put my make-up on ... when I had not. I'm 61, and really appreciate that kind of comment! So, a product that leaves my skin refreshed, renewed and visibly improved. I'll be using this mask a lot! Another great product from OZ Naturals. 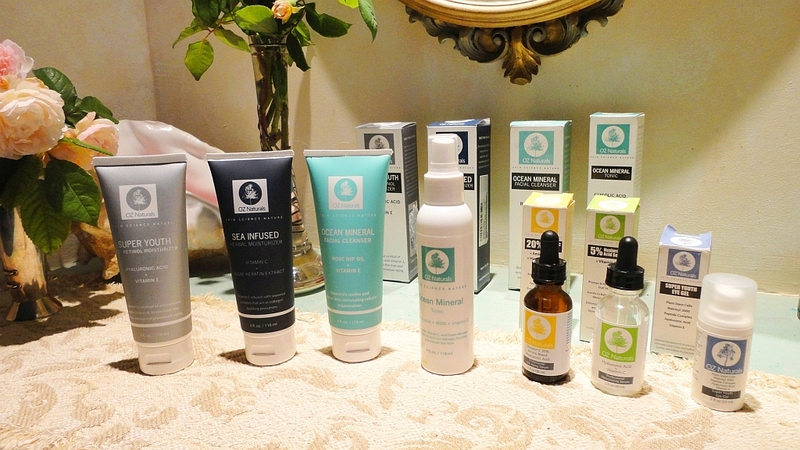 When I was offered to try out some of their products for review purposes, I researched the website and found that it offered everything I like in skin care: natural ingredients (mostly botanical), no fillers, no parabens, no artificial fragrance or colourings, no animal testing, suitable for sensitive skin, with a definite anti-ageing focus. At 61, and having always taken care of my skin, I am dealing with natural loss of collagen and expression lines that are becoming more and more entrenched. I also have some discolouration due to age and sun damage. Because my skin is increasingly more sensitive and fragile, I had given up facial cleansers as simply too aggressive. So I approached this cleanser with great caution. The ingredients seemed OK: rose hip oil, vitamin E, MSM (organic sulphur) but mostly sea-derived minerals. 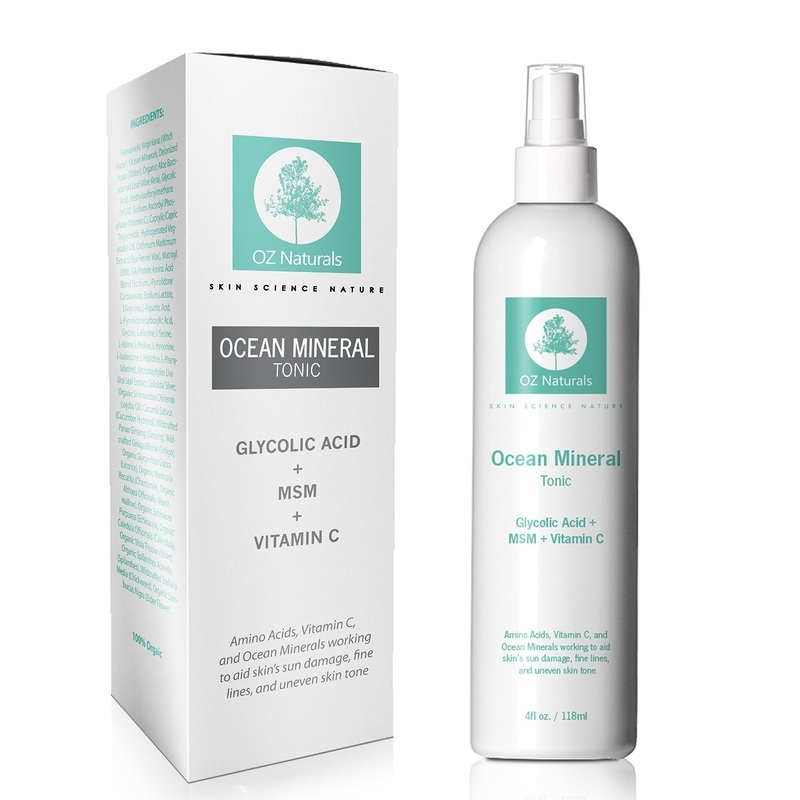 I had already seen great results with seaweed-based preparations, and I love their Ocean Mineral Toner, so I was willing to risk it. 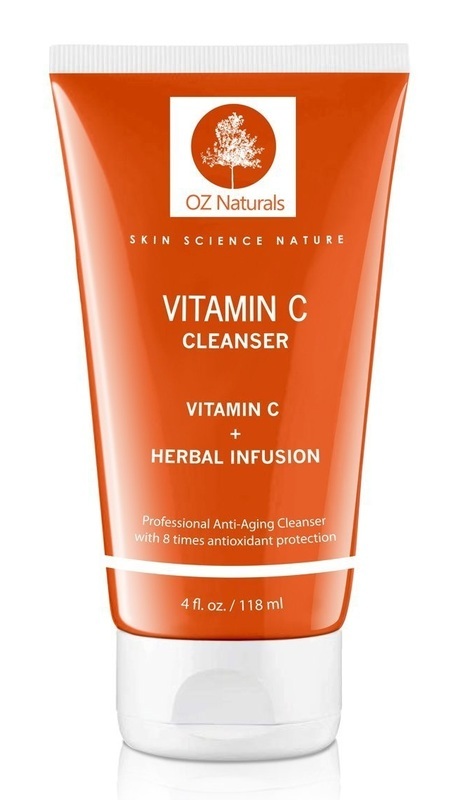 Happily, this cleanser is very good. In fact, it's fabulous! I can again start and end my day with a refreshed and clarified face and enjoy the benefits of hot water on my skin. My pores are tighter but there is no dryness or irritation. Like the other OZ Naturals products, the scent is very light and fresh, so my husband can use this, too. I'm not usually given to superlatives, but the whole line is excellent. At these prices and considering how long the products last, they are also economical and a great investment in my skin's well-being. Having tested other OZ Naturals products, I was curious about this toner because my increasingly sensitive skin has been reacting badly to any kind of astringent product (except Rose Water). It got to the point that I simply stopped using toners. I'm happy to say that my skin really loves this refreshing, bracing formulation and I now use it several times a day. The bottle is quite big and lasts a long time. My husband has been using it as an after-shave spritzer and his skin has never looked better. He had been plagued by some persistent irritation that only responded to calendula and now he has this new product to help the healing process. I believe the sulphur has something to do with it. Out of all the OZ Naturals products kindly sent to me for review, this is probably among my top three favourites, which is really saying a lot. 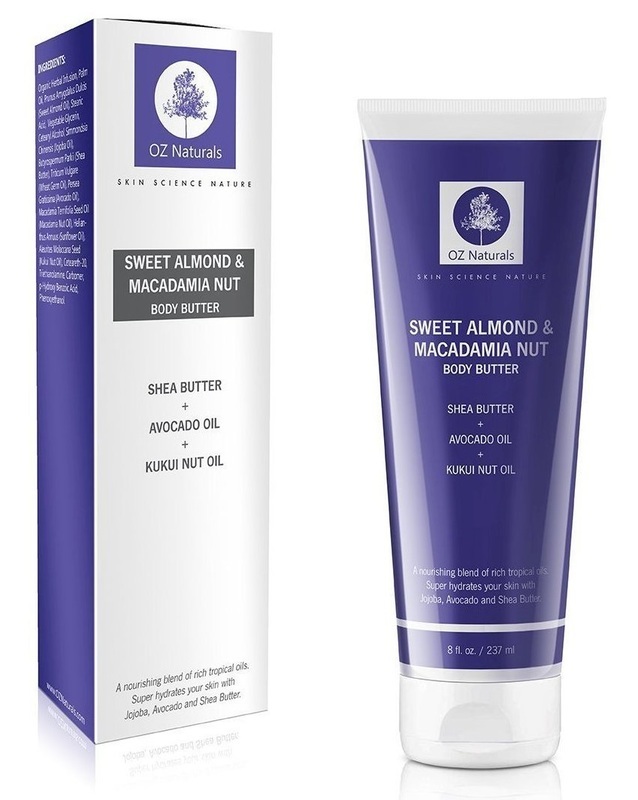 Very similar in purpose but quite different from the Macadamia Nut Body Butter, to describe it in one word, I would say: refreshing. Aloe Vera is one of the main ingredients, along with Olive Oil, Shea Butter and Jojoba Oil. The very large tube contains 8 fluid ounces, for the price it's an amazingly good deal. Since I started my test period I have been using this cream for everything: it's a perfect body moisturizer because it is completely absorbed and lets me dress immediately afterwards; it's great for hands, elbows, knees, neck or any place where my skin gets particularly dry; but it is especially fabulous for my face as a top layer. I am 62 and my skin has changed drastically in the last few years. What works for me is to use a good serum, followed by a retinol cream or similar, and a top layer to seal everything in. This product makes a fantastic top layer, not only at night when I can really lather it on, but also for the day because it does not leave an oily residue. I love everything about it, the texture, the fresh, natural smell, but above all what it does for my skin. My wrinkles are less evident, my skin seems more elastic and my colour is more even. I can even use it on the delicate area around my eyes. Because it does not have an obvious perfume, my husband can use it as well, especially to sooth his skin after shaving. Like other OZ Naturals skin care, it contains only natural, non-toxic ingredients (not tested on animals) but based on sound scientific research. The whole line is up there with the very best skin care I have ever used, and I like it so much that I have bought again several of their products after my review sample was finished. Probably one of my favourites from OZ Naturals. I actually love all the products they kindly sent me for review, and this moisturizer is something I will buy again when the original sample runs out. It comes in a very large tube (4 oz, which is easily double what the average jar of face cream contains) and only a small amount is needed to cover my whole face and neck. So, great value for money. It was easy enough to persuade my husband to join the testing once he found out that the silky gel-like lotion has no particular scent and disappears completely into the skin, leaving behind a smoother but definitely un-shiny face. So now there's two of us using the tube and it's lasting really well. We are three weeks into the trial period and, as usual, I have discontinued my previous skin care so I can observe how the new products affect me. At 61, and having used some excellent skin care for months now, my success gauge was to simply maintain the recent improvements. I can say that this moisturizer actually exceeded my expectations. It seems to plump up my expression lines so they are less visible and soothes winter's dry skin irritation. 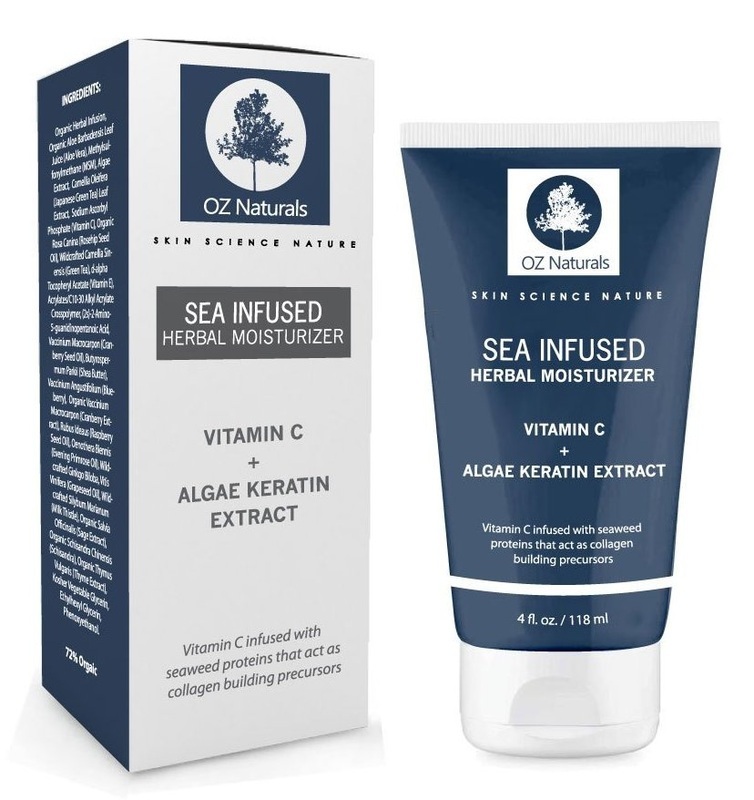 It contains algae extracts and vitamin C, and is said to act on the skin's collagen. It's a great complement to the Retinol moisturizer of the same brand. I use them on alternate days and really love their combined effect. I can't get rid of my wrinkles completely without fillers or surgery, but these products are making me feel so much better about my skin. 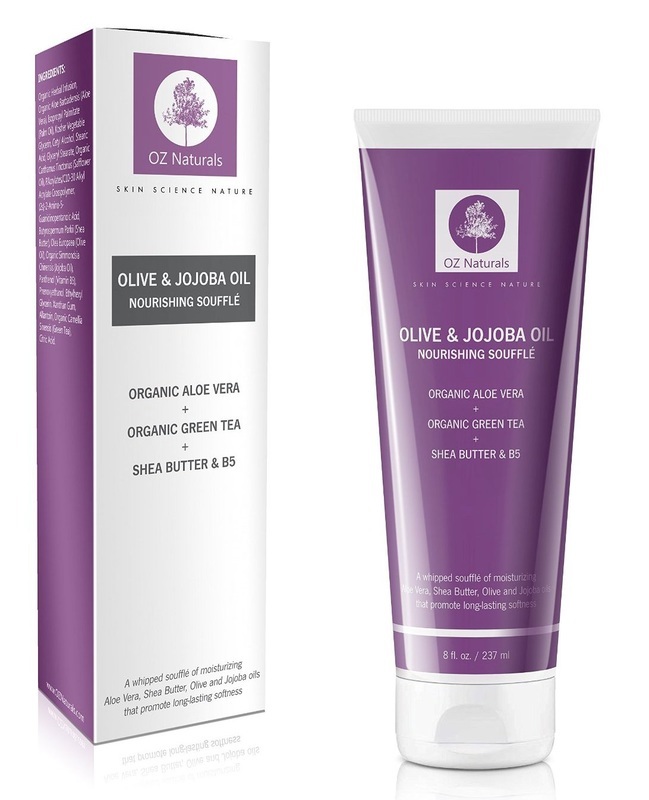 I am one of the lucky reviewers who were asked to try out, and report on their experience with, OZ Naturals products. The information on the website was promising: natural extracts and essential oils, not tested on animals, no parabens, no artificial colourings or perfumes, the most powerful anti-ageing ingredients available. At 61, and having used some excellent products for months now, I was simply hoping to maintain the improvements that my most recent skin care regimen had produced. 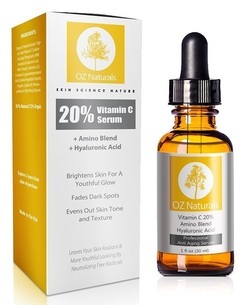 I'm happy to say that I'm really impressed with the whole range of OZ Naturals skin care products, and this amazing preparation is one of my favourites. Nowadays most anti-ageing creams claim to contain retinol (an animal form of Vitamin A) but I have used some that did nothing for me and some that caused irritation. This product, however, really works for my skin and has exceeded my expectations. After only two weeks of regular use, my skin seems tighter and more compact, especially over the cheeks and jawline and absolutely no signs of redness or irritation. Even the deep lines above my top lip are less evident. It's difficult to tell what each product does, but I think using the whole range maximizes the synergy and avoids conflicts. My routine involves layering the OZ Naturals products as recommended on their site (i.e. cleanser, toner, serum, eye gel, moisturizer) but I like to alternate between this and the Sea Infused moisturizer because they have a very different action. The Retinol 2.5% is a dense, white cream that disappears into my skin in seconds leaving it visibly firmer. It is perfectly suitable for daytime use under make-up because it leaves no residue and does not make my face oily, however, I prefer to use it at night and after my weekly session with a derma-roller. Sometimes I top it with a natural oil like hazelnut or watermelon to really maximise the hydration. I like the generous size of the tube (4 oz is more than double what most jars contain). It should last a long time, making the price really affordable. Because it's so easily absorbed and does not have an overpowering scent, I've convinced my husband to use it, too. Fabulous moisturizer. 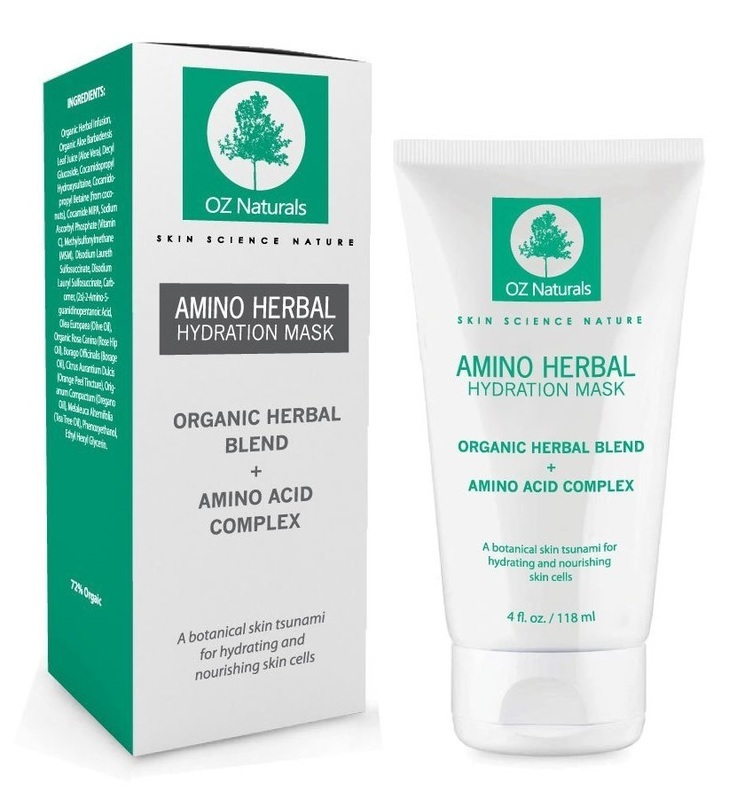 When I received an invitation to try some products from the OZ Naturals range, I did my usual research and read up about the brand and its products before accepting. I only have one face and my skin has become increasingly sensitive with age, so I have to be very careful about the stuff I put on it. I was intrigued by the clearly scientific approach, the full disclosure of ingredients and the cruelty-free statement. Also the active ingredients are exactly those I have so far found most effective: hylauronic acid, peptide complex, vitamin E and some plant-based extracts. Plant stem cells and Matrixyl 3000 were new to me but sounded promising. As usual, when testing skin care, I started using this eye gel by itself, discontinuing my previous eye cream, and hoping for the best, because I do have problems with dark circles, lines and puffiness. This eye product is an almost clear, medium-textured gel which disappears into my skin after a very short massage, leaving a perfect basis for make-up. That, in itself, is rare in my experience. Usually eye-specific preparations are either too light and almost drying, or else they tend to leave a greasy residue which surfaces later through foundation or primer. This gel can be applied several times a day, so I used it first thing in the morning after washing my face and at night after cleansing, in combination with a serum (also by OZ Naturals) and topped by a night cream. Now, does it work? The maker suggests that full results can be seen after 60 days of regular use, so I am hopeful for even more, but so far (after three weeks) I can see a definite improvement. My dark circles are much less evident, my skin is smoother and I can use a bit of concealer without ending up with a caked and lined mess. 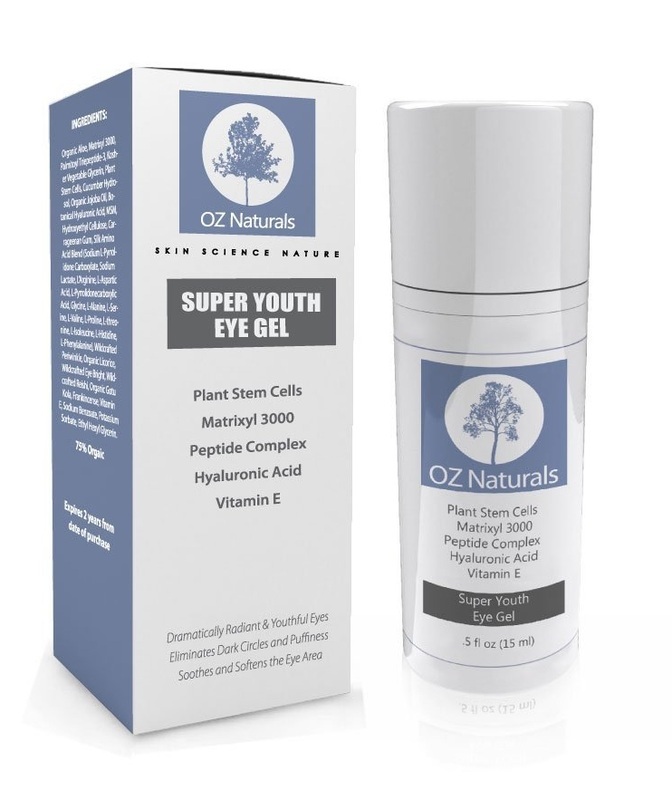 Also my eyelids are firmer and less puffy and I like the fact that I can apply this gel to the top of my eye, most products are not recommended for the eyelids. I could see a visible difference, especially when looking at photos taken a month ago, but I got the clearest confirmation the other day, when I happened to look at my face mid-afternoon and was dismayed to see that a hint of bags had returned under my eyes. And then I remembered: a house guest had disrupted my routine and I had forgotten to put the gel on for two days! I quickly remedied and was able to reapply foundation without the raccoon-eye look that some other gels produce. The bottle holds ½ fluid ounce or 15 ml of gel, and I have no idea how much there is left, but the pump dispenser works extremely well and it seems I only need a tiny amount each time so it appears to be very good value for money as well. In any case, this is a product I would not want to be without, so I will be replacing it once it runs out. As far as eye creams go, it's the best specific product I have ever tried and absolutely gentle and non-irritating in this very sensitive area. Reading the list of ingredients (which I always do), this body butter sounds good enough to eat! Packed with soothing and nourishing oils (sweet almond, macadamia nut, avocado, jojoba, wheat germ, shea butter and sunflower), I love to put it on my skin after sunbathing. It puts moisture back and leaves behind the most discreet and attractive sheen to help bare legs and arms look smooth and elegant. The other day, I came in having taken an hour of late afternoon sun. For some reason, the skin on my neck and chest started to feel itchy and irritated as though it had been touched by poison ivy. I washed well and then spread some of this butter on and, to my delight, within 10 minutes the redness and itchiness had disappeared! I absolutely love the texture, it's very creamy at first but quickly dissolves, releasing a very light but pleasant scent. It reminds him of those sweet-smelling, uncomplicated suntan oils I used to buy in Hawaii. This body cream is one of the few that actually seems to do something about my wrinkly elbows, and I often put it on my face as well, especially at night on top of a retinol cream, to counteract the slightly drying effect of the retinol. This body cream is one of the few that actually seems to do something about my wrinkly elbows, and I often put it on my face as well, especially at night on top of a retinol cream, to counteract the slightly drying effect of the retinol. I love everything about this product: made from natural extracts and exotic oils, not tested on animals, no parabens, no artificial colourings or perfumes, some of the most powerful moisturizing and anti-ageing ingredients available. The tube is huge, a full 8 fluid ounces and, since so little is needed each time, I expect it to last a couple of months. I received this product in exchange for an honest review and will buy it again once my sample is finished. 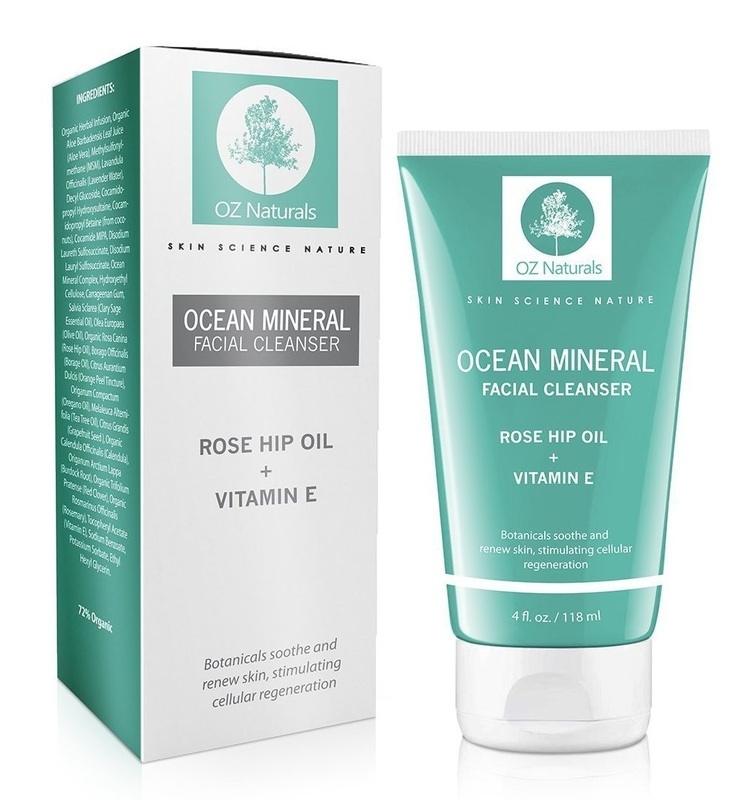 I had already tried, and really liked, the Ocean Mineral cleanser in this line, so I was curious to see if I would find any difference. Reading the description and the ingredients, this cleanser focuses on anti-ageing, with special attention to hydration and discolouration. In my experience so far (using this gel every evening), I can say that it is just as effective a cleanser as the other one, leaving my skin incredibly fresh and with a toned look that I love. It is also true that my face feels hydrated but never “pulled” as with other cleansers I have used, which made me feel like my skin would crack if it didn't quickly receive some nourishing cream! So the claims so far seem to be fully justified. I am also thrilled to notice a gradual fading of some serious sun damage on both sides of my face. The clear gel has the faintest fresh scent and, like other OZ Naturals products, is perfectly suitable for men, in fact it is proving very useful for my husband, too. His face has been plagued by a persistent irritation which gets worse after shaving. This very gentle cleanser seems to soothe and calm the redness without drying his skin. 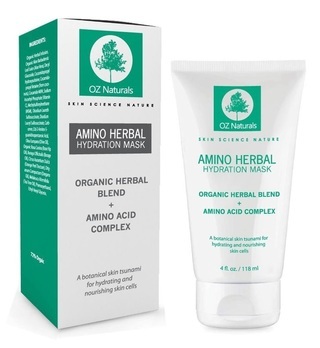 This is one of the products I have been asked to test and review for OZ Naturals, and I have no reservation in recommending the whole range. These are excellent skin care products that work extremely well in combination with one another and, given the tiny amounts needed at one time, they work out to be very reasonably priced. Who would have thought that my skin could glow? At least that's my impression, comparing photos taken last week with others from two months ago. And I don't mean glow as in polished-apple shine, but rather as the opposite of dry, dull and lifeless. My skin seems firmer, smoother and more even in tone, and the wrinkles around eyes and mouth are less visible. Another thing I've noticed is that my foundation, primer, face powder or whatever make-up I put on my face seems to glide smoothly and evenly instead of caking or turning shiny. I must confess I had never heard of OZ Naturals when I was invited to try their products. I did some research before accepting, because I know that my ageing skin (I'm 61) has become fairly sensitive and fragile. The brand may be new but everything I read about them reassured me: solid science, powerful natural and, mostly, organic ingredients, full money-back guarantee and, very important to me, no animal testing. 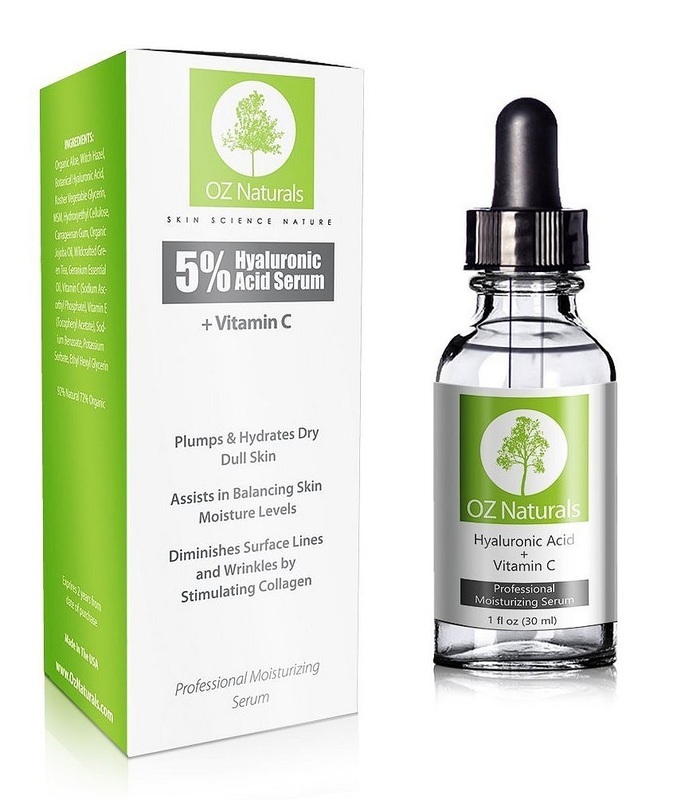 I emailed the OZ Naturals support group with some questions I had about serums in general and their formulations in particular, and within 3 ½ hours I received a comprehensive and very helpful reply which spoke volumes about the seriousness and customer care of this company. Also on their FAQ page I found lots of information and a clear explanation of how to use these products in combination with each other and with other skin care. For my evaluation, I discontinued my previous serum and eye cream and started using these products instead. Since a serum is a carrier, I followed up twice-daily applications with my usual natural oils and creams, but good as they are, they work even better on top of these powerful carrying agents. I also love this serum's calming, cooling action after derma-rolling when my skin is a bit tender. After three weeks of regular use, I'm delighted with the early results I have seen. My husband has noticed as well, and I have persuaded him to share my samples. Since these products have no scent and disappear without leaving the skin oily, they are perfectly suitable for men, too. It's still early to see full results, especially on “mature” skin, but the improvement so far has been remarkable and it leaves me hopeful that these serums can actually soften and diminish some of the signs of age that can be so distressing. Compared to some lavishly advertised brands that choose to pay for a famous face to promote their offerings, these products are plainly presented, moderately priced but seriously effective and I will be happy to buy more, once my bottle runs out.